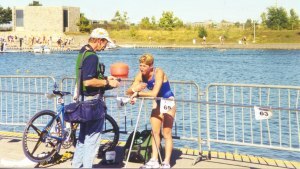 This photo, of me and Tim, is from the 1999 ITU World Championships in Montreal. I have had the good fortune during my triathlon career to race in exotic locations all over the globe. I raced in Australia, St. Croix, South Africa, Japan, Brazil, Sweden, Guatemala, and Portugal, to name a few. I often stay a few days after the race to tour the sites and sample the local cuisine (and, of course, the better the race, the more enjoyable the post-race jaunts). In many instances, families hosted my stay, further enhancing understanding of the culture of the various countries. In 2008, I started the season doing 5 races in 5 different countries. It was exhausting, but I explored parts of the world that are forever embedded in my memory and I perhaps would have never had the opportunity to witness. One of my very few non-triathlon related excursions (apart from trips to visit family) was my honeymoon to Costa Rica. The bike was left at home (I think there was a bout of separation anxiety) leaving us plenty of time to partake in the adventures the country had to offer. We enjoyed white water rafting, zip lines tours, sea kayaking and had mixed results with mountain biking (I am not a fan of riding over logs and through streams, its unnatural). We even spent some time lounging on the beach (well, only one day, the novelty of doing nothing wears off quickly). Generally, though, since I do travel so much, when I have down time I like to spend it at home. How important is it to be on time? Why? Why not? Are you always? I am so glad that Tim brought this up, as I have a constant battle with some of my training partners about this very issue (I won’t name anyone, but you know who you are) and it grates on my nerves when people amble onto the pool deck 10 minutes late for masters swim workouts without good reason. Timeliness is very important to me; making people wait is impolite, whether it is a friend, colleague, co-worker or medical professional, so I always try my best to be on time to scheduled events. My friend, who ironically is almost never on time, offered up this ditty: “Those who are late think they are better than those who are on time because they are making them wait.” Hmm. Interesting assessment. I have an unwarranted reputation that I go hard in training all the time. I am not entirely sure how this rumor started but perhaps it is because I am a stickler about starting on time. While I certainly approach my workouts seriously and with certain goals in mind, and I have been known to be a teensy bit competitive, I also have almost fallen over from laughing so hard at the inane and often grotesque conversations that occur on rides and runs (I have learned a lot about things I never wanted to know about). I believe in mixing the incredible physical and mental intensity with humor and incorporate ambling workouts in which the only objective is to enjoy the surroundings. Maybe I need to smile more when I am going hard.